Sometimes you just need a little CRUNCH, am I right? You're leading an organic lifestyle now though, and a bag of potato chips just isn't an option because you don't want to feed your body toxic, addictive chemicals and preservatives - especially not the ubiquitous MSG! (Side note: there can actually be MULTIPLE forms of MSG in a single bag of potato chips, in addition to thing like citric acid and gum arabic [used in printing, paint production, glue, cosmetics...YUM?] ) Fear not! The snack food aisle shall be your weakness no longer and arabic gum shall forever be removed from your diet and bloodstream (thank goodness!) - I'm going to hook you up with some divine alternatives to give you that crunch without navigating off-track! Your New Go-To for CRUNCH! 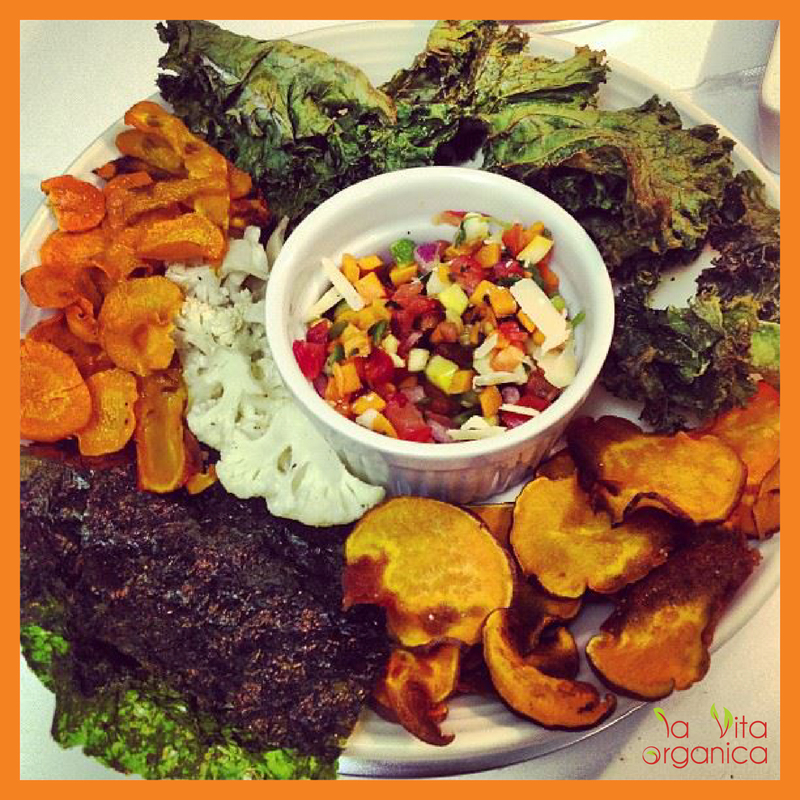 Carrot, Kale, Sweet Potato, Seaweed & Cauliflower "Chips"
Wash, dry and peel your veggies. Then, using a large potato peeler or mandolin slicer, create thin "chip-like" slices of your veggies. You can mix it up and slice them longways for longer, curling "dipper"-like chips, or in the typical shape of a chip. Spritz the baking sheet with your organic oil of choice. Now the fun part - Customization!!! I typically add the veggies and ingredients listed below for each flavor in a paper bag and shake them up. You can also just place the veggies on the baking sheet, spritz with your organic oil of choice and the sprinkle the seasonings on top (except Salt & Vinegar, for which I recommend shaking). Well, I could just go on and on with suggestions, but those should cover the majority of your cravings! Now, I turn it over to you! Consider yourself on the path toward chip-aholism recovery! Have fun with it - play around with your organic seasonings - mix up different combos at once to please the whole fam! And please come on back and show off your your ideas and colorful photos with us!